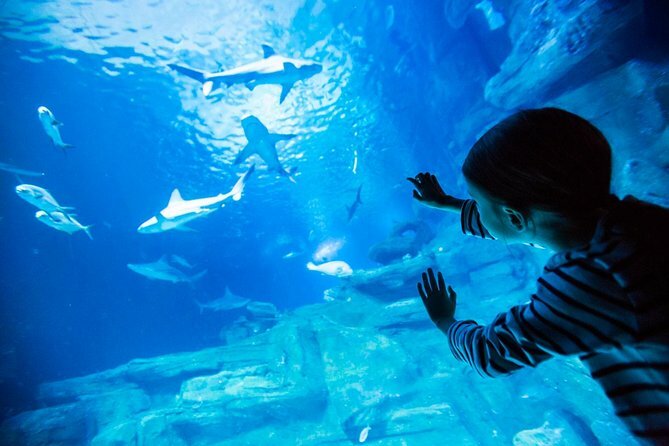 Located in the Trocadero Gardens, the Paris Aquarium (Aquarium de Paris) showcases a variety of fish and other marine life, including nearly 40 sharks. Watch a film, visit the touch pool, or simply wander through the exhibits full of 3 million liters of water. This is a great way to keep kids entertained if you need a break from Paris' historical attractions. The Paris Aquarium is just across the river from the Eiffel Tower in the Trocadero Gardens. With your pre-booked admission, exchange your voucher for a physical ticket at the aquarium, and then go inside to begin your discovery of the underwater world. See sharks, sea urchins, sting rays and more; the marine life on display represents ecosystems around the globe, from France to the Indian Ocean. Visit the touch pool, a favorite with children who love to 'pet' the creatures, and check out the aquarium's two cinemas, which show documentaries and cartoons. This is nearby the Eiffel tower, so it was nice to do something different than something historical afterwards the Eiffel tower. It was funny and relaxing, especially for children. The are many cool sea animals to see, and it is inexpensive. The Aquarium location is awesome. You can see the Eiffel Tower from the front door. The Aquarium itself is ok. Not very big. Not a lot to do or see. Took us maybe an hour or less to get through the aquarium. However it was a nice break for our children, just turned 5 and 2.5.